of the Sierra Club. Welcome to our Website. NEW: The upcoming DPS potluck info can be found here. NEW: Big News! Maturango, Argus, and Navajo have been voted to be delisted. Click here for the newly revised DPS list. NEW: Starting in 2018 and continuing through 2019, new subscriptions to our newsletter, The Desert Sage, are free for the first calendar year. Subscribers will receive the electronic Sage. Anyone can subscribe to the Sage, for $10/year, or $20/year for a Sustaining subscription. We suggest that if you are currently receiving a hardcopy Sage you subscribe at the Sustaining level. Only 1 subscription is required per household. To become a member of DPS (eligible to vote in our elections), you must be a Sierra Club member, climb 6 of the 96 peaks on the DPS peaks list, and subscribe to the Sage. Peak Update: EDGAR PEAK SUSPENDED (3/11/18) Edgar Peak (San Bernardino County) resides in the Providence Mountains State Recreation Area. The staff there has communicated to several DPS leaders and Management Committee members over the past several months that the entire area is closed to cross-country travel. As there is no legal way to access the peak, the Management Committee has voted to suspend it until the area is open. Neighboring Mitchell Point can be accessed legally via DPS Route D only. Please do not use Mitchell Routes A, B, or C as these travel within the State Recreation Area. The Mitchell Caverns are now open but require advance ticket purchase on-line. Send subscription/membership applications, renewals, and address changes to the Membership Records Chair: Ron Bartell, 1556 21st St, Manhattan Beach, CA 90266; ronbartell@yahoo.com. Include your name, address, and email address; and for renewals, a check payable to DPS; and to apply for membership, include your Sierra Club member number and the 6 peaks you’ve climbed (with the dates if possible). For membership forms, see the About Us page under Membership. The DPS Guide is online now for all DPS members. Our Road and Peak Guide Editor, Jim Morehouse, invites you to share your comments on updates to driving conditions and/or climbing routes for DPS peaks by sending an email to desertpeakssection@gmail.com. After climbing a peak, simply send in a quick email while things are still fresh in your mind. We would also welcome volunteers to join a DPS Road & Peak Guide Committee to assist with updating the current Guide. Please contact Jim if interested in assisting with this very important project! Pahrump Point, California, a Section listed peak. Last light on Pahrump Point (5,740') from the camp in the Chicago Valley. The peak is located northeast of Shoshone, CA off of State Route 178, east of Death Valley National Park and just west of the Nevada state line. 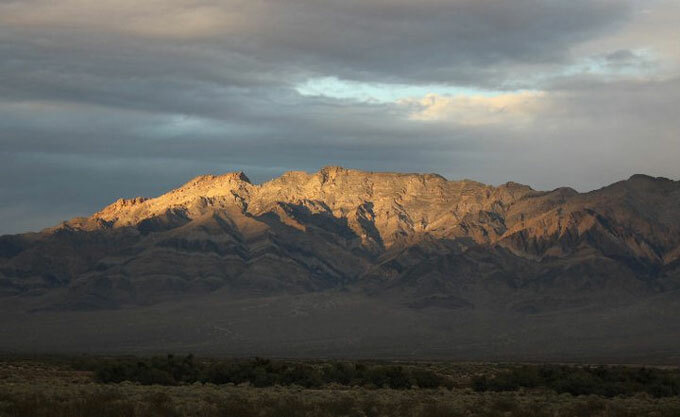 Pahrump Point is located in the Nopah Range Wilderness Area administered by the Bureau of Land Management. Detailed information on climbing this peak is contained in the Desert Peaks Section Road and Peak Guide. The photograph was taken by Section member Ron Bartell on a Desert Peaks Section trip with Leaders Daryn Dodge and Kathy Rich in December 2010.